Hola!! First lesson?? Take advantage of this offer for the first class. Feel free to look at my profile and if you have any questions, you can send me a message and I can help you with it. ¡Hola! :) Do you want to learn Spanish? ¡Learn with me! I love teaching my native language that's why I'm a Spanish Teacher, I have more than 2 years teaching my native language to different people in the world. 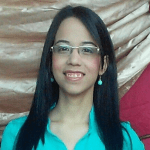 I’m Astrid Machado from Venezuela. I am a professional graduated from the university as a Petroleum Engineer. In 2016, I decided to teach Spanish as a second Language, now I have more than 3000 lessons given online. I have more than two years of experience on this area and one of the best thing I love about teaching a new language, it is to learn so much about other cultures. It is a pleasure for me to help you learn a new language or practice with what you have already learned about the language. I believe understanding a new language and culture can be life changing, in an exciting and meaningful way but I am here to make you feel confident and happy during that process. My lessons will be focus on your needs, no matter if you have problems with pronunciation, vocabulary or grammar. If you wonder how I organize the lessons, please read below. - You will learn basic alphabets and how to write and pronounce it clearly. - You will learn basic verbs (conjugations) and nouns. - You will learn how to make basic sentences from them. - I will help you with building up new vocabulary and expressions. - In the meantime, you will learn about different tones and connotations. - You can choose a topic, and we can discuss it together or we can just have random conversations. - During the discussion, I will correct your pronunciations and teach you better expressions to express your opinions. - Depends on the way you would like to have the lessons; I will share with you interesting material that I have always prepared for the lessons.